Losing family can be traumatizing to cats. Cats have a reputation for being cool, aloof and independent creatures. That doesn't mean they don't get emotionally attached to their caretakers and owners. When a cat experiences the loss of a human companion, she often reacts with anxiety and even depression. Change is hard for felines. A cat's beloved owner passing away usually results in a drastic change to the cat's routine, naturally. When a cat just doesn't know what to do with herself, she tends to feel stressed out and disoriented. Grieving cats may stop using their litter boxes in favor of spraying pungent and messy urine all over your home -- even if they have been either neutered or spayed. One key sign that a poor kitty is grieving is change in her eating patterns. 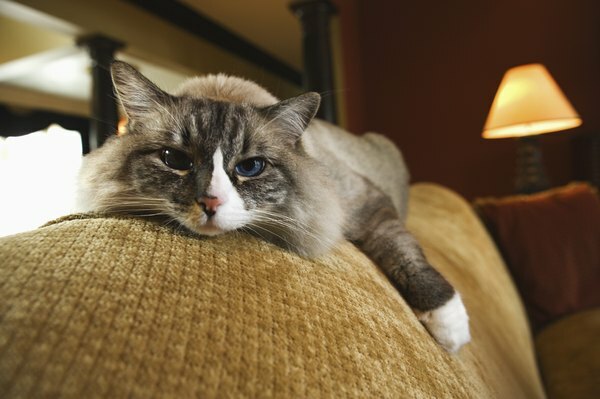 Stressed-out cats tend to lose all interest in their food, resulting in weight loss. If a cat used to attack her plate gluttonously but now would rather sleep through mealtime, it's probably because she's grieving. A cat in mourning may become increasingly vocal -- much to your dismay during the early morning hours. Grieving felines tend to loudly and persistently meow and yowl -- especially when it's pitch dark outside. When cats are stressed out and at a loss for what to do, they tend to display repetitive, obsessive-compulsive behaviors. Perhaps a cat is grooming herself excessively. Maybe she's nervously tugging on her coat and losing large amounts of hair as a result of it. At the other end of the spectrum, a cat may completely neglect her grooming duties while she's mourning the absence of a key figure in her life. Cats are notoriously sleepy creatures. Many healthy cats sleep the day away during the best of times. However, excessive sleeping is definitely an indication that a cat is confused, sad and upset about a major life change. Grieving cats often simply don't seem like themselves. If your previously jovial cat seems to have lost her natural "joie de vivre," she is indeed in mourning. Cats that are going through a big loss often hide away from people and lose all interest in their favorite pastimes. Just like humans, fluffy felines get depressed, too. Though you may feel helpless watching a cat suffering from depression, that doesn't mean that you can't do anything to improve her situation. Spend as much time with kitty as possible -- cuddling up to her, playing hide-and-seek with her and even chatting with her. If she feels neglected or lonely, a little bit of attention from you may go a long way in getting her back on track. If time doesn't bring upon any improvements in the crestfallen little one, you may want to speak to her veterinarian about possible anti-anxiety medications. Feline Advisory Bureau: Do Cats Grieve? Can You Contract Giardia From Cat Feces? Do Cats Feel the Loss of an Owner?